A film shoot can be a mystifying event to witness — scenes shot out of sequence, last minute script and camera angle changes, actors doing emotional monologues with big green screens. How do editors weave this chaos into a coherent dream? Two words. Script supervision. It’s the job of the script supervisor to keep track of a thousand small details and to ground unpredictable directors so that the final narrative isn’t riddled with jolting continuity errors and other fatal audience distractions. There’s nothing more detrimental to a movie than a cluster of ‘What the..?” murmurs buzzing around the darkened theatre on premiere night. Filmmakers need continuity pros to keep track of things. Come to think of it, there are some embattled Hollywood A-listers who could use a full-time continuity professional in their midst. Here are some reasons why. Another key script supervision responsibility has to do with camera position and the axis of action. Imagine you’ve got a scene with where your protagonist is curing a ham. An imaginary line will connect your protagonist to that ham. The camera will need to stay on one side of the line to maintain a firm spatial relationship between the two subjects. 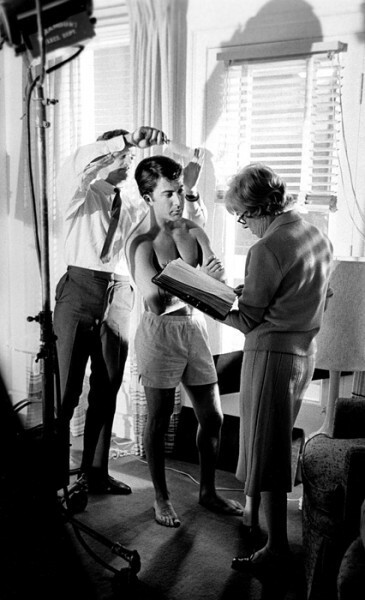 The script supervisor helps the director position the camera so that it doesn’t cross the axis of action and disorient the audience. Watching Charlie Sheen self-destruct and then punch himself in the face with his ‘Torpedo of Truth’ tour invoked that kind of audience confusion. I’m not saying a script supervisor could covered up a Charlie Sheen-grade meltdown, but he or she might have positioned the whack-job more favourably. The script supervisor keeps the most current version of the shooting script. If any changes are made by actors or directors during the filming that will affect the next day’s shoot, it’s the script supervisor’s job to let the other departments know. I love Clint Eastwood, but I have to believe that if anyone had taken note of his plans to dabble in the fine art of political satire and had let Mitt Romney’s crew know, the entire Republican National Convention debacle could have been avoided. The script supervisor does paperwork and sends a report to the production company after each shooting day. These reports include the scenes covered and the number of takes and retakes. The script supervisor is the official timekeeper and gives production the raw data needed to anticipate problems on the horizon. If Arnold Schwarzenegger had contracted someone to send regular reports to Production, a huge scandal might have been avoided. Perhaps the fact that his housekeeper’s son was starting to look very much like a famous Austrian bodybuilder would have been spotted earlier and dealt with in a classier way. Just a thought. Look, Hollywood A-listers will probably never grasp the benefits of having a script supervisor in their entourage, but that doesn’t mean you can’t forge a rewarding and lucrative career for yourself in the film industry with these skills. Script supervisors are in extremely high demand. Raindance Toronto is offering an intense, two-part primer course in Continuity and Script Supervision on September 22nd and September 29th.